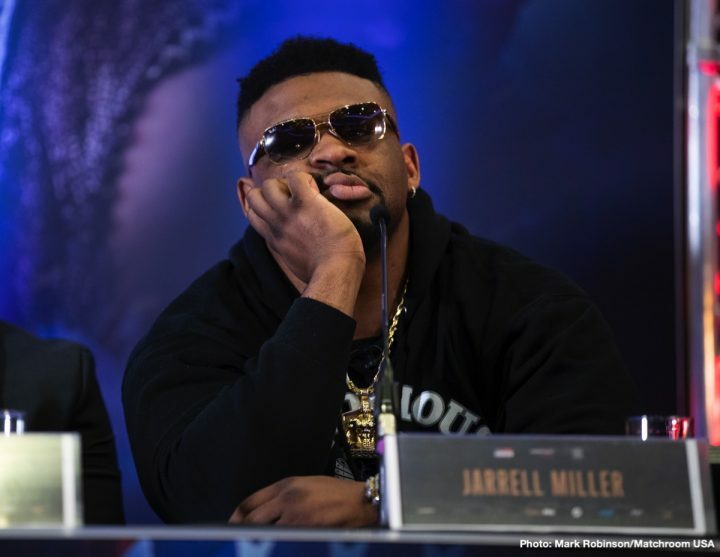 By Trevor McIntyre: Jarrell “Big Baby” Miller’s failed drug test could cost him a massive $4.75 million payday if his title fight against heavyweight champion Anthony Joshua falls through, according to ESPN. The $4.75 million that the 300+ pound Miller (30-0-1, 23 KOs) would lose is just the tip of the iceberg in lost revenue for the New Yorker, however. Miller would lose a lot more according to Dan Rafael. – $1.5 million x 2 [$3 million total] for two fights on DAZN AFTER his June 1 fight against Joshua. Miller wouldn’t need to beat Joshua for him to get those two fights with DAZN. They would be comeback fights for him following his likely loss on June 1. With Miller testing positive for the banned substance GW1516, those two fights could go away now, since there wouldn’t be a Joshua title fight. – Massive millions that Miller would receive if he beat Joshua on June 1. With Joshua’s chin and stamina problem, you couldn’t rule out the possibility of an upset for Miller if the fight took place. But if Miller doesn’t face Joshua due to his failed drug test, then he could forget about pulling off the upset. Instead, Miller would likely be looking at a lengthy suspension from boxing, and then a long rebuilding process. Miller’s previous career high purse was a $500,000 payday on November 17 against Bogdan Dinu. Miller stopped Dinu in the fourth round. Joshua’s promoter Eddie Hearn of Matchroom Sport is actively scouring the heavyweight division for a potential replacement opponent for the June 1 card on DAZN and Sky Box Office at Madison Square Garden in New York. Sadly, some of the names that Hearn is looking to replace Miller with are less than desirable opponents. There are two good names that Hearn is looking at in Luis “King Kong” Ortiz and Adam Kownacki as a potential replacement for Miller, but the fighter that reportedly has been given an offer is 34-year-old German based heavyweight Manuel Charr (31-4, 17 KOs). He’s currently the WBA ‘regular’ heavyweight champion. Hearn could try and interest U.S boxing fans in subscribing to DAZN to see Joshua fight another world champion, even though Joshua holds the main WBA strap, known as the ‘Super World’ belt. Charr has the lesser title called the WBA ‘World’ heavyweight title. The World Boxing Association has two champions at heavyweight for some peculiar reason. The substance that Miller tested positive for, GW1516, is also referred to as Cardarine and Endurobol. It’s a substance that helps the users of the product lose fat while improving their endurance. It’s a “metabolic modulator,” according to ESPN. It’s banned it’s a risky substance to use, as it’s caused cancer in testing with laboratory mice. It’s unclear how long the mice were given the product before they developed cancer. Miller, 30, will have to meet with the New York State Athletic Commission at a hearing for them to decide whether they’ll give him his boxing licence to fight Joshua on June 1. If the Commission decides to license “Big Baby”, then his fight with Joshua will likely proceed for June 1. It’s not a good sign that Joshua’s promoter Eddie Hearn is working hard to find a fast replacement for Miller. It shows that he suspects that the New York Commission will decline to license Miller. Recently, the Commission chose not to license middleweight Willie Monroe Jr. for his scheduled fight against interim WBC middleweight champion Jermall Charlo on December 22 last year after Monroe Jr. tested positive for an elevated level of testosterone. Charlo ended up facing replacement opponent Matt Korobov on the December 22 date. If Miller doesn’t get the fight with Joshua, it’s unclear whether he’ll ever get another opportunity like this again. Miller is still young, and unbeaten. If Joshua holds onto his heavyweight titles for the next 10 years like his promoter Eddie Hearn believes he will, then it’s quite possible that Miller will eventually be able to work his way back into a title fight situation. With that said, he will probably need to be the mandatory for Joshua in order for that to happen. It’s not realistic that Hearn would hand-pick Miller a second time for a voluntary defense for Joshua. It was Hearn that selected Miller from a list of heavyweight for Joshua to make his U.S debut on June 1 at Madison Square Garden in New York. Hearn believed that Miller, with his gift of gab, would help sell the Joshua fight by doing a lot of talking. For Miller to get a second shot at Joshua, he’ll need to work his way to a #1 position slowly, and then hope that AJ doesn’t start vacating belts like Hearn is saying he might do. What Joshua wants is to unify the heavyweight division. Once he does that, he’s expected to start vacating titles so that he doesn’t get trapped making pointless title defenses against challengers that bring nothing to the table. When Joshua vacates his titles down to just one strap, it’s going to make things harder for Miller to become his mandatory, because he would need to beat someone good like Luis Ortiz, Dillian Whyte, Joe Joyce or Adam Kownacki for that to become a reality. Miller got the title shot this time around the easy way by beating these heavyweights: Tomasz Adamek [42-years-old], Bogdan Dinu, Johann Duhaupas , Mariusz Wach , Gerald Washington , Fred Kassi , and Nick Guivas . Miller’s resume is embarrassingly bad for a heavyweight title challenger. Hearn picked Miller out specifically for his unbeaten record and his ability to talk. It obviously doesn’t hurt that Miller is slow, over 300 pounds, and easy to hit. Hearn doesn’t want Joshua to lose his next fight. The Joshua vs. Miller fight isn’t officially off as of yet, but it’s not looking good right now. For Miller, he could lose out on his lottery ticket. It was there in his hand, but it’s now looking like it’s gone.